China has made it mandatory for foreign car manufacturers to work with local companies if they want to make cars in the country. While it has relaxed the rules on building plants for manufacturing vehicles, it maintains a strict control on the permits needed for testing self-driving tech on the licenses needed to make digital maps of the country’s roads. Those maps are crucial for the autonomous driving systems which is why companies like BMW and Ford have teamed up with Baidu. Huawei and Audi did not disclose the terms of their deal. They have only said that this will result in cooperation in the field of autonomous vehicles. Huawei’s Mobile Data Center is integrated into the Audi Q7 prototype that was showcased to the public during Huawei Connect 2018. This data center reportedly has multiple artificial intelligence chips, a LIDAR, cameras, a central CPU, and is mounted on the roof of the car. 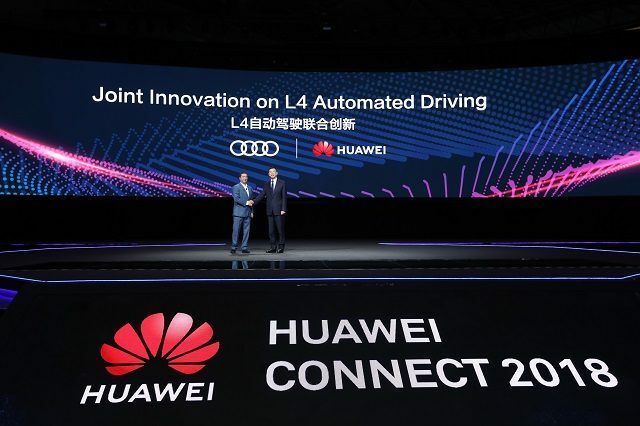 Huawei’s work with Audi will also extend to connect car solutions and vehicle-to-vehicle communication.